Rabiah Hussain was born and bred in East London and her family are originally from Pakistan. She studied Politics and English Literature at undergraduate level and has an MA in Global and Comparative Politics. She freelances as a digital marketer to pay the bills, but is a poet and playwright first and foremost. ​As a guest blogger for The F-Word in January, she is writing about the importance of intersectional feminism and how the current political climate is affecting women of colour. She wants to highlight why mainstream feminism needs to be more inclusive and why we must listen to the voices of marginalised women. A few years ago, while working in an office, an older colleague posed the question “Why aren’t women good at football?”. When there was little response from the others around me, I forced my opinions into the discussion, adding some references to modern-day feminism. Once he left, my female colleagues admitted they weren’t sure exactly what feminism was. Once they looked up the definition, they all said that, of course, they agreed with what it stood for. Their perception of feminism up until that point had not been one of gender equality but of man-hating, shaven-headed, shouting lesbians. This, unfortunately, is an issue feminism has faced for as long as it has been around. Belittling or stereotyping feminists is a key tactic used by patriarchy to keep progress at bay and feminism hasn’t been able to wholly defend itself in the face of this. However, at a time when true activism is needed, feminism also has an opportunity to truly redefine itself. But this redefinition needs to include the voices and experiences of all marginalised groups. If feminism is to respond adequately to current issues, it must be intersectional. To put it bluntly, mainstream white feminism needs to re-evaluate itself. Last weekend, a universal display of solidarity against the election of Donald Trump gave us something positive to hold on to in these bleak times. 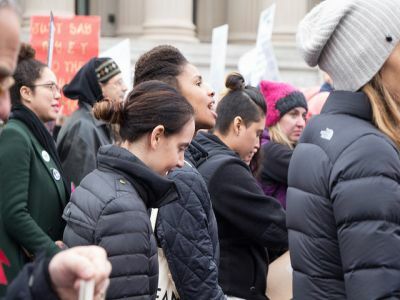 Women from all over the world rallied together to send out a simple but important message to the new President and his ilk: women’s rights are human rights. If ever there was a time to come together, it is now. Feminists will surely find themselves at the forefront of the fight against regressive policies and sexism at all levels of society in the next few years. But if the Women’s March highlighted unity in the face of patriarchy, it also pointed to a very bitter truth that must be confronted if we are to react to the current climate. The mission of the organisers of the march was to defend the most marginalised in society. What became clear in the narrative responding to this was the offence taken by many cis white women to being asked to recognise and stand up for minority groups. As women of colour asked for their voices to be heard, they were accused of being divisive. Asking white women to check their privilege became somehow disruptive to the entire movement. Statements like “Not all white women” and “We are all women first” risk leaving behind a large population of women who simply cannot identify with feminism as it currently stands. Feminism cannot be based on the myth that the experiences of all women are the same and that every woman faces just one type of discrimination. Let’s take the Trump presidential campaign. Trump not only showed utter disrespect for women, he also offended people of colour, Muslims, disabled people, immigrants and LGBTQ communities. 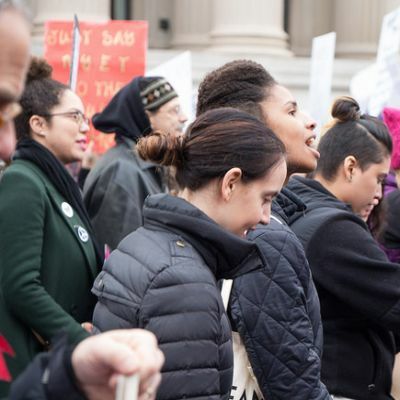 His various policies on policing, healthcare and immigration particularly affect minority groups and, when your identity intersects along these lines, you are doubly impacted as a woman. That is not to say that straight cis white women cannot also be disadvantaged by these policies. But it highlights the problematic nature of asking for all women to be united. Because let’s face it, the problem doesn’t simply come from the outside. Mainstream feminism hasn’t always acknowledged the complexities of intersecting identities and Black feminism arose to address this. A large percentage of support for Trump comes from white men and white women, and his election has highlighted the emergence of white supremacy from the shadows. We simply cannot fight the so-called ‘alt-right’ that Trump’s presidency has empowered without acknowledging that whiteness is a problem. Not because all white people are racist, but because whiteness affords a certain privilege that isn’t bestowed on minority groups. Minorities are still fighting for a place at every level of society. Women of colour and LGBTQ women are misrepresented in the media. Women of colour earn less than their white counterparts. Black women experience particular prejudice and violence from police officers. The fight over the bodies of Muslim women leaves them vulnerable and fearful. This list can go on. As women, we are facing scary times. But let’s not forget that for minority women, the world has always been a scary place. The fight against patriarchy today simply cannot be won if mainstream feminism continues to marginalise. If we are to come together, feminism must be intersectional. Or else it will surely fail.